My Sterling Stearman biplane was purchased in a hobby shop in Utica, New York, sometime around 1989. I was working at my first job as an electrical engineer for General Electric, fresh out of the University of Vermont. Money was really tight with two small children and having just shelled out a lot of bucks for my electrical engineer degree (including about $16k worth of student loans). Accordingly, my modeling budget was at a nadir, so the $25 for a kit, and $20 for some Sig dope was a good way to get involved again. I still had an OS .25 RC engine, so I added a third line for throttle control. That didn't work out so well, so I removed the line and just fixed the throttle wide open. I flew the Sterling Stearman biplane a couple dozen times from the parking lot of the SUNY parking lot. It would barely do a decent loop, but did fly well inverted and could do a wingover. Maybe it was because of the lack of performance that I did not destroy it while living there. The photo at the top was taken in Colorado Springs, CO, which is where we moved in 1994. 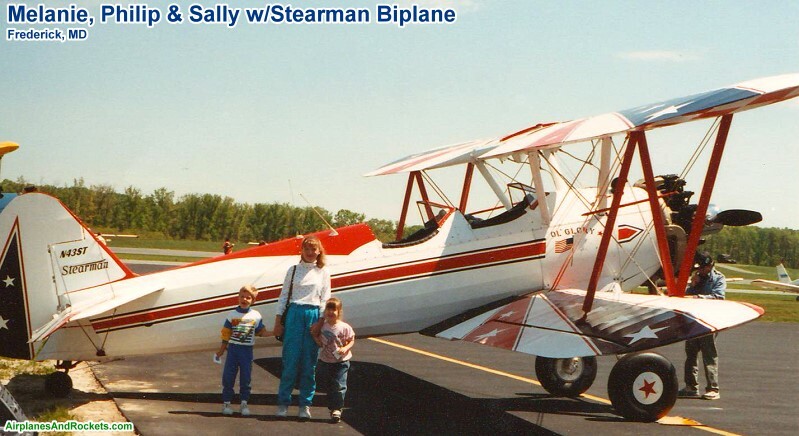 Somehow, the Sterling Stearman biplane lasted that long. Remember my theory about the airplane surviving because of the lack of power that made it non-stuntable? Well, that theory was proven after I bought a Fox .35 for it. Not long afterward it met with the same fate all of my stunt control line planes eventually do. Not pretty. 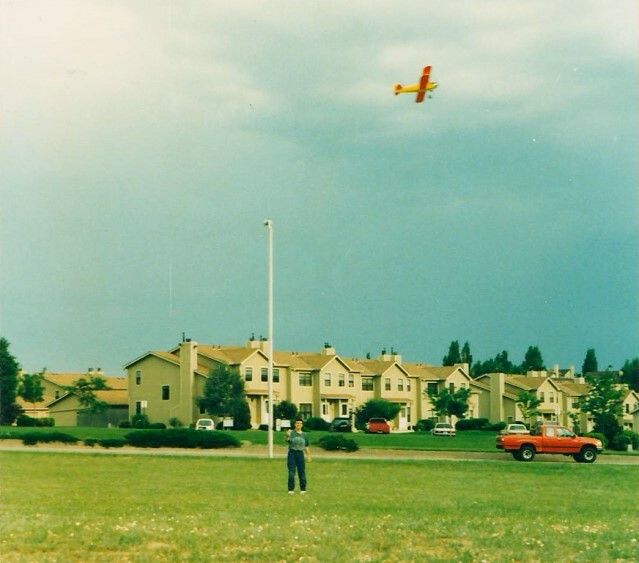 I have rarely crashed a radio control airplane to the point of no return, maybe because most of the maneuvers are performed much farther away from terra very firma. 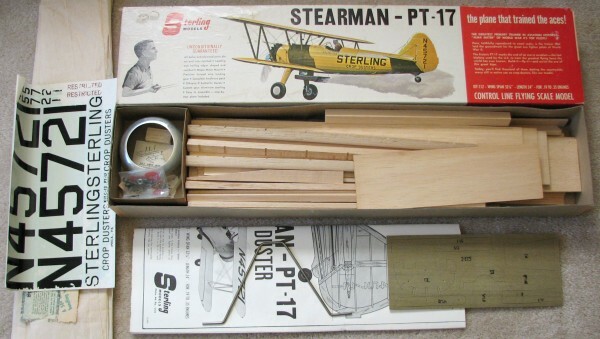 As part of my effort to reacquire many of the models of my past, I bid on and won a Sterling Stearman biplane kit on eBay. Prices seem to be rising daily. With the exception of a little damage to the decals (see photo below), the contents of the kit appear to be in excellent condition and it looks like all the parts are there. I have seen these kits sell on eBay for more than $150. This kit has already been sold; thanks for looking. To the right are screen shots of a couple completed auctions to show what the Sterling Stearman biplanes are selling for on eBay as of December 2007. It is amazing what people will pay for the old kits. Come to think of it, I amazed at what I paid for mine. 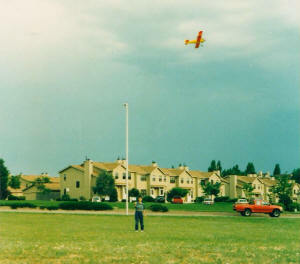 To the left are Melanie, Philip, and Sally, at an air show in Frederick, Maryland, with a full-size Stearman biplane, sometime around 1991.